Welcome to this week’s Technique of the Week. This week we’re going to talk about brake lever set-up and a little about braking technique. I always want to pick a topic that will be relevant to riders of all levels, and his one hits that mark. The first bit should a no brainer for most advanced riders; but; don’t worry, it’ll get pretty interesting as we move through the content. First, we’ll cover getting one finger out there on the brake lever instead of two or more, why this is important, and a few ways we can go about getting this set-up to happen and still manage all the controls on our bars. This is a big deal for many beginner riders. I very often see riders braking with two or more fingers per lever and/or trying to ride technical sections without first “covering” the brakes, neither of which we want to do. Next: the angle of our brake levers. Again, I see many riders, even quite advanced riders, with their levers way to low. We’ll talk about where they should be and why. 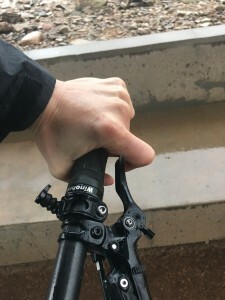 And, finally, we’ll talk about lever throw, and, particularly the throw of the front brake lever and how playing around with this may help more advanced riders find a little extra speed and stay out of trouble. Braking isn’t just about slowing the bike down and stoping it. But — especially at the upper levels of riding — braking is very much about speed control and/or momentum management. Often, we don’t need to slow down, we just need to not go any faster. Often, we should be accelerating, but not as fast as we would be if we were entirely off of the brakes. There is a also a massive difference in braking technique between slowing the bike down — actual deceleration — and speed control. These are nuances that very few riders understand. This is a huge reason why even many pro downhillers still believe — incorrectly — that you shouldn’t brake in corners or through rough sections (and why many coaches and coaching programs still coach this). This is also why when I bring up the subject of braking in camps, many riders, in a joking self deprecating fashion, proclaim “oh, I’m real good at braking!” or “I know all about that part!” When, in actuality, they’re way off. Do we have the time and space to cover all of braking technique in the blog post? No. That’s the stuff we do in camps. But, getting brake set-up dialed in is the first step to this and that’s what we’re going to dive into. . . . and, some technique, of course. First — and this will be fairly obvious to the advanced riders (hang in there; we’ll get to the good stuff in a bit) — we need to set the brake levers up so that we operate them with one finger, not two . . . definitely not three or four. I’m pretty blown away at the amount of riders that still use more than one finger on a brake lever. 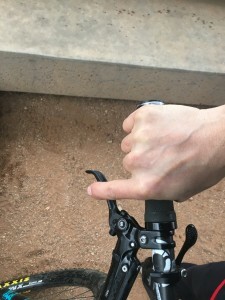 Often, bike shops and professional bike fitters are the culprits of bad lever position and this seems to promote bad technique. 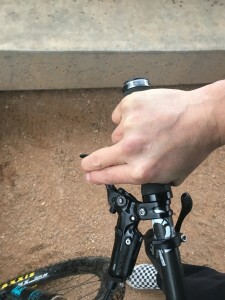 Traditionally, when a bike is built up, the brake perch will be next to the grip and touching it, with no space between grip and the brake perch. Often, we will need to move the brake perch in-board a bit, creating some space between the grip and the lever in order for our finger to touch the lever in the correct spot. What is the correct spot? Way out on the end, tucked right into that little bend. This often means that we will need to swap the order of brakes and shifters and and adjust the reach of the lever. (all decent brake levers will allow for reach adjustment (or how far away from the grip the lever resides). This also can sometimes mean that we will have to ditch the integrated brake/shifter/dropper-seatpost configuration that some component companies offer. I still run all of my components on their own exclusive clamps because the integrated options never seems to allow me to get my controls right where I like them to be. The pointer finger is the braking-finger of choice for most riders. However, the middle finger will also work especially if the rider has small hands. But, either way, we need one of our first two fingers on the brake lever and the other on the grip. And, this is how you should be riding the bike whenever things get rowdy. This is called “covering” the brakes (Look at any photo of top enduro or DH riders—one finger on each brake lever). You need to have a finger out there operating the brakes while also having a powerful grip on the bars with the other fingers and thumb. This is very important because we’re simply not going to be able to move our braking finger back and forth between the brake lever and the grip and effectively brake. Also, our first two fingers offer powerful gripping strength. Our ring and pinky? Weak. So, covering the brakes in technical terrain is essential while having the other of the first two fingers on the bars for gripping strength. One finger on the lever. Proper contact point. Good stuff. Notice how the lever has been scooted in-board a bit. Now that we’ve got only one finger out on that lever, we’re going to talk about the angle of the lever. Most riders have those levers way too low. Again, this is often the fault of shops and bike-fitters; the lever angle is usually set in regards to the rider being in a seated position and with the bike on level ground (the traditional way to set up road bikes — which is where most pro bike-fitters are still coming from). Quite obviously, the brakes will be used the most, and be most important, when to bike is pitched forward while we’re descending (not when the bike is level). Also, the rider should be low on the bike while descending; and, although the rider shouldn’t be leaning back, he will be back relative to where he would be if he were seated if he’s in good descending position. This means, that in order to keep a straight wrist for power and control, with the elbows and upper body in proper proximity to the bars, the levers will have to be angled quite a bit higher than most rider have their levers set. If the levers are too low, and we’re in the proper position on the bike while descending, we’ll have to start bending our wrists to reach the brake levers. This is not a strong and powerful position of the wrists (Imagine trying to do a bench press with bent wrists). In other words, if you intend to ride trails with steep descents, your levers should be set a little too high for when the bike is on level ground, enabling them to be set-up correctly when the bike is pitched forward and you really need them most. Andy finally, let’s talk about lever throw, or how far the lever has to move before the brakes actually engage. And, this one is gong to come down to the rider’s personal preference, something for the more advanced riders to maybe play around with. I’ve been messing with this a bit myself lately and haven’t come up with any solid conclusions as far as what’s absolutely right or wrong, but I do see how this could work out well and help alleviate some bad braking habits. In the past, I’ve always run my brakes with exactly the same throw, front and rear. And, I always wanted both brakes to engage right when my fingers were bent at ninety degrees. However, I do recall numerous top-level riders, back in the day, who did run their levers with a ton of throw, particularly the front brake, so that the lever was basically at the bar when the brake engaged. I never really heard a decent explanation why this was done. The explanations that I got didn’t make much sense. But, those dudes were all really fast, so things couldn’t have been too bad. As I learned more about properly braking a two wheeled vehicle (And, keep in mind, this happened years after what could be considered a fairly respectable stint as a mid-pack professional downhiller with very occasional flashes of brilliance. So, I must’ve been doing an OK job of braking previously), I realized that the front brake is waaaaay over used at the high levels of riding. The front brake is essential to deceleration. But, very often, deceleration isn’t the goal with braking; as stated earlier, often speed control and/or momentum management is the goal which requires much different braking technique than deceleration. Unfortunately, too many riders grab front brake when they don’t need it, and, thus, shouldn’t be using it. The front brake is a very powerful tool and a huge asset to your riding. But, like any powerful tool, use it incorrectly and you’re going to hurt yourself. And, this could definitely attribute to why lots of lever thrown for the front brake may be a good thing: we simply don’t want to use it unless we really need it, and that extra bit of pull could be just enough to take away that initial bite of front brake when you don’t need it. There’s no way I’d ever attempt to give a full break down of braking technique via internet. But, in terms of this post: the front brake is going to offer the arbitrary 70 – 90% of stopping power to a vehicle on level ground. Let’s go with that. The harder you brake the more traction is needed to deal with those forces of deceleration. If your deceleration forces over come the traction, you skid. An unwanted skid can mean loss of control, particularly when it comes to the front wheel. When we’re in situations where traction is very minimal—rough, loose, steep, stuff; hard cornering—it’s essentially too late to decelerate the bike. So, stay off the front brake. Because of it’s power, weight transfer while decelerating, etc. (more than we can get into here), and very minimal traction, it’ll almost definitely break traction of the front wheel and skid and that can very easily mean loss of control in the above situations. But, you can almost always control speed by dragging the rear brake. Really, in these situations dragging the rear brake is all you have. And, If the rear wheel does break traction and skid a bit—which it will, at times—it’s not the end of the world. We’ve all had that happen. In the above situations, it’s very important for the front wheel to maintain direction. That may mean continuing an arc through a corner, or maintaining a straight line over the uneven, off camber surfaces of a rock garden. You can’t take away traction from the front wheel — in the above situations — by braking or you’re going to give up the ability to maintain direction: brake here, and you’ll either skid or have to take a different path that requires less traction. There’s simply not enough traction to go around. . . 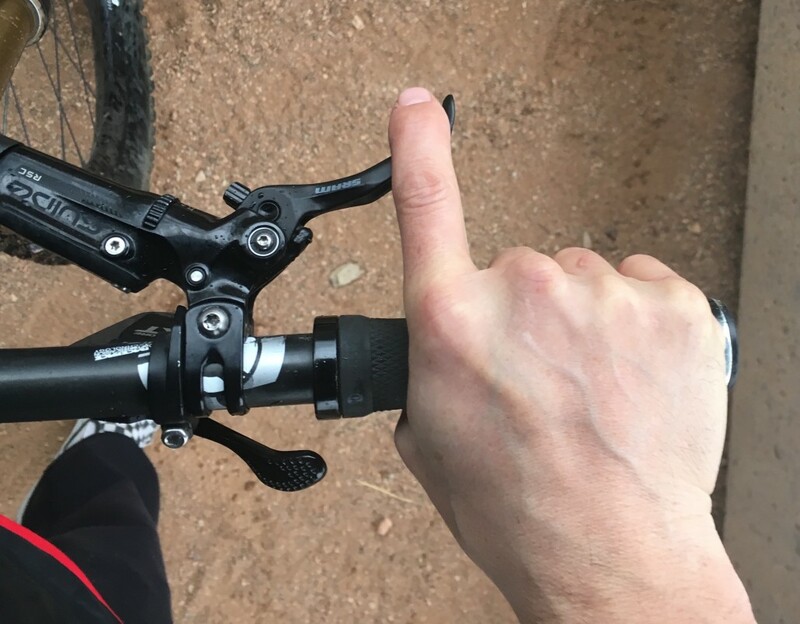 This is where taking the edge off of that initial bite of front brake — with more lever throw — may help you out if you have the habit of grabbing front brake when you shouldn’t. The front brake will drastically slow the bike down. The rear really won’t slow it down that much at all (it’ll simply skid the rear wheel if you do try to decelerate hard, which is usually controllable). If you have the habit of grabbing front brake when it’s not necessary, you’re also slowing down when you don’t need to. Tap both brakes before the jump and then case the heck out of it? (We’ve all been there, right?) I almost guarantee if you just tapped a little rear brake—no front—you would have greased it. As stated above, often we don’t need to slow down, we just need to not go any faster, and doing this correctly translates into faster times. It’s also much easier for the rider to get thrown forward and out of position if they panic and grab both brakes because of bad braking habits (because, obviously, this will engage the front, thus, decelerating the bike, usually much more than the rider would like), rather than keep their cool, dragging some rear, maintaining good position, visually focus on solutions, and riding it out. So, again, here’s where having a lot of lever throw on the front brake can be a good thing. You simply have to pull that lever a bit farther to engage it. It may help you to not over use it by grabbing too much front brake if you do happen to panic-brake. 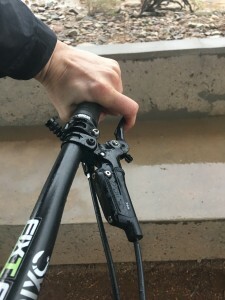 I’m not so sure that running a lot of thrown on the front brake lever is such a good idea on public trails with other trails users, where you may need to suddenly and unexpectedly stop. Let’s just say that I discourage that. But if you’re on downhill trails, bike only, directional, etc., where you can safely work on finding and keeping speed; especially if you have the habit of grabbing front brake when you don’t actually need it, running more throw in that lever may be something to play around with. Nice article Andy. My lever throw preference has always been short and tight front, long and slow rear for XC racing and general trail riding. This way when stopping is urgent the front brake is ready now! In the back I don’t want it to lock up so I use long travel to allow me to drag and feather for speed control. I set it so it locks up the rear wheel just before hitting the bar. Also, I use a 203mm rotor up front and a 180 in the back. The asymmetric rotors combined with asymmetric lever throws allow each brake system to do what it does best. I’ve never understood manufacturers that put the same size disc on front and back or bike shops that set both brakes to engage instantly.